The 13-point fourth quarter* was nothing about which the Atlanta Hawks can or should be proud but with the 15-point fourth quarter debacle in Milwaukee still less than a week old an impotent offensive performance in which missing open shots shared culpability with poor ball movement doesn't seem as dire as Atlanta's defensive performance in the fourth quarter in Dallas. *The nadir was clearly the sight of the Hawks, coming out of a timeout with 2:14 left in the game, completely flummoxed by the Dallas zone they'd played against for much of this game and a fair amount of their previous meeting (but not on the previous possession...tricky, Rick Carlisle, very tricky), passing the ball around the perimeter until Joe Johnson could hold it, back up, and take a contested 28-footer from the right sideline with the shot clock winding down. The short explanation for Atlanta's fourth quarter defensive performance would be that Larry Drew had 60 minutes of individual minutes to allocate in the fourth quarter and 39% of them went to Mike Bibby, Jamal Crawford, and Josh Powell. Sufficient though that fact might be to illustrate Drew's priorities, it fails to tell the full picture of ineptitude. Mike Bibby's first stint in the game lasted four minutes and eight seconds. During that time DeShawn Stevenson scored two of Dallas's 10 points and assisted on six others. The first quarter witnessed not just Stevenson matching his season high in assists for a game but Stevenson creating open looks for Dirk Nowitzki. Such a display throws into question the very existence of someone Mike Bibby could successfully guard but, when Rick Carlisle went to a backcourt of Jason Terry with either Jose Juan Barea or Jason Kidd and Shawn Marion and Dirk Nowitzki as his forwards, in the fourth quarter there was no one on the court Mike Bibby could successfully guard. The Hawks have been outscored 85-48 over their last three fourth quarters. Mike Bibby has played 27:22 of those fourth quarters during which he has scored three points on five shots, earned one assist, and grabbed two defensive rebounds. Clearly, the need for Larry Drew to "see more production" exists on a case-by-case basis. Josh Smith really undermined Drew's absolutely correct decision to leave Smith in the game after committing his fifth foul with 6:16 left in the game and the Hawks down 10. This after giving Smith the Horford Treatment in the first half. Smith lasted two more possessions, one offensive (he took, and missed, a three-pointer from the top of the key) and one defensive (while defending Brendan Haywood in the post, Smith fouled Haywood before he could either commit a turnover or miss a shot). With Smith disqualified and Al Horford appearing seriously fatigued after having played more than 45 minutes the previous night, Drew made the reasonable (but also telling from a depth and roster construction perspective) decision to insert Damien Wilkins into the game to guard Dirk Nowitzki. Less reasonable and absolutely indefensible? The decision to have the Hawks begin switching ball-screens so that Dallas could get Jamal Crawford defending Nowitzki in the post whenever they wished. Dallas clearly considered doubling Joe Johnson to be situation-dependent rather than mandatory. Johnson had a productive (27 points, 6 assists, 8 rebounds) and reasonably efficient game (24 shots, 1 free throw attempt) but other teams might show a willingness to let Johnson take more shots than any two of his teammates combined rather than encourage ball movement from a team all too willing to take what the defense gives them. Jeff Teague looked really good playing with some starters in the second quarter and late in the third, less good playing alongside Crawford, Evans, Powell, and Pachulia at the start of the fourth quarter. The Hawks being -7 in the 7:15 Josh Powell played upon his re-emergence from suspension and inaction was all too predictable but, ooohhh, put-backs. In their last two road games, the Hawks have been outscored by 31 points and lost both to a team missing three starters through injury and a team that released a starter immediately following the game. "We played, I thought, three good quarters and then in the fourth quarter we had a collapse. Shot selection was not very good. It just comes down to getting tougher in the fourth quarter. You’ve got to do the things that are going to assure you victory." "I thought the game was going great until the start of the fourth. It got out of hand and we never recovered from it." "We've been in this situation enough times to learn from it. It's something we've got to get better at." "It just comes down to getting tougher in the fourth quarter." Damn. I was really hoping for it coming down to holding players accountable for their offensive and defensive performances in the fourth quarter. Or at least necessitating more than one player suspension for Josh Powell ever to play for the Atlanta Hawks again. "I don’t think it’s discouraging. On the road, it’s always tough and you have to play the right way and do everything right to win and we just had a little slippage the last two outings." "We just had a couple careless turnovers and a couple of little touch fouls. It got them in the bonus early and they were able to utilize the line a little bit." Smith's complaining about the officials is not limited to the game itself. "It's about spreading it around. Offensively, guys are penetrating in and it's beautiful. Coach Carlisle told us it's a beautiful thing to watch when you see guys move the ball the way we do. He said there's probably only two teams that do it in this league, and it's us and San Antonio. It's the reason for our success." The Atlanta Hawks' Marvin Williams has been suspended two games without pay for throwing punches and fighting with the New York Knicks' Shawne Williams, it was announced today by Stu Jackson, NBA Executive Vice President, Basketball Operations. Shawne Williams has been suspended one game without pay for throwing a punch during the altercation. The incident occurred with 43.7 seconds remaining in the fourth period of the Hawks' 111-102 win over the Knicks at Philips Arena in Atlanta. Marvin Williams will serve his suspension during the Hawks' next two games: tonight at the Dallas Mavericks and Wednesday, February 2 vs. the Toronto Raptors. Shawne Williams will serve his suspension tomorrow when the Knicks play host to the Detroit Pistons. "That was almost a similar situation like we collapsed fourth quarter against Milwaukee. Losing focus of what got us the lead. I threw the challenge down at halftime. We played well, let’s see what we are made of the third quarter because we knew that team was not going to quit. But we got into a situation of trading baskets and against a team like New York you can’t do that because they have a lot of firepower." What, again, was the most important thing from the loss in Milwaukee? "[W]e have to learn from it. To me, that's the most important thing. It happened to cost us a game but the most important thing is that we learn from it. We cannot allow that type of play in the fourth quarter. We cannot allow the snowball effect." There was some of "that type of play" in the first half of the fourth quarter but good play far outweighed it over the course of the game. "I’m proud of the way our guys responded. They did not lose their composure. They got back into a rhythm. Josh Smith did a great job when we were struggling somewhat for a basket and we were able to post him and he took advantage of it, made some really nice moves down low." "Everyone looks at his scoring but I look at his assists and rebounds because those are areas we really need help in. And he’s been defending like crazy. He guards ones, he guards twos. I’ve always stated that he’s a very underrated defender." Also, if Larry Drew likes Joe Johnson's rebounding (10.8 DR%), you know who he might love? Jeff Teague (12.6 DR%). He had his usual ho-hum, 19 points on 12 shots night, with 14 rebounds and 6 assists tossed in. Is there any doubt that Al Horford is an All-Star? Despite not getting 21 shots like Amare Stoudemire, Horford outplayed him across the board. Put Horford in an offense that averages more than 90 possessions a game and see what kind of numbers he might put up nightly. Once again, Horford was boss in crunch time...scoring 5, grabbing 2 rebounds, and mixing in an assist and block. [Smith] was clearly into this game and was a factor on both ends of the floor. His final line of 24 points, 9 rebounds, and 4 assists looked much better but the 9-13 shooting may have been the best part. He started inside and got some easy baskets in transition and usually after getting in a rhythm that leads to more success from the outside for Smith. He knocked down 2-3 3-point shots including one to push the lead back to eight late in the fourth. ATLANTA INJURY REPORT: None listed, but several Hawks are playing hurt. PREVIOUSLY...the New York Knicks beat the Miami Heat 93-88 last night in New York behind 24 points from Amar'e Stoudemire and 19, 13, and 6 from Landry Fields. Danilo Gallinari pitched in with a late three-pointer. Mike Bibby is probably going to be asked to guard either Fields or Gallinari for long stretches tonight. It was the second straight win for the Knicks following a six-game losing streak. The Knicks have lost four straight road games. The Atlanta Hawks beat the Knicks 99-90 in New York on November 27th in a rare instance Al Horford-centric fourth quarter basketball from the Hawks. SI.com: Lowe: Josh Smith’s shooting: fluke or new skill? Smith is shooting more long twos than ever before and more threes per game than in any season since 2006-07, and he’s making both shots at a career-best rate. He has been above 40 percent on three-pointers for most of this season, which is perhaps why we haven’t heard much lately about Hawks coach Larry Drew and Smith butting heads over long jumpers. The question: Was it an early-season fluke, or has the seven-year veteran, 25, learned something? If you’ve been watching the Hawks, you know Smith’s numbers over the last six weeks have come crashing down. In his last 16 games, he’s just 11-of-40 (27.5 percent) from three-point range. And those long twos? During his last 20 games — nearly half Atlanta’s season — Smith has hit just 23-of-74 jumpers from the area between 16 feet and the three-point line. That’s 31 percent — almost exactly Smith’s career rate from this range and well below his season-long rate of 39 percent. That higher figure is obviously the result of some hot early-season shooting. It will be interesting to watch the rest of this season to see where Smith’s jump-shooting numbers settle. My money continues to be on numbers that look much like his career statistics. This is not a knock on Ravin, by the way. By most accounts, he’s a fantastic teacher, and if Smith’s numbers don’t improve at all, it doesn’t mean Ravin did a poor job. It might mean that Smith isn’t following his technical advice anymore — and come to think of it, I wonder if Ravin has been watching Smith’s games — or it might mean that Smith just isn’t a very good jump shooter and won’t ever be one. There's the rub. After last night's game*, Smith is making 39.1% of his long two-point jumpers, 36.7% of his three-point shots, and 72% of his free throws this season. He has definitely improved his shooting stroke. It's just not good. And, because he hasn't used his improved skill to augment his strengths but as end to itself, his overall offensive game has suffered. His eFG%, TS%, and assist rate are all down from last season. According to Synergy Sports, Josh Smith ranks 158th in the league in points per possession as a spot-up shooter. And that's with him making more than 40% of his twos and his threes when classified as a spot-up shooter. *Not reflected in these numbers are the four 14-foot jumpers he missed in Milwaukee. Just as Josh Smith's temporary renunciation of the three-point shot last season did not mean he actually improved his shot selection, his actually improved shooting stroke, no matter the degree to which he has improved his shooting come season's end, does not mean he has improved as an offensive player. The good folks at StubHub have come through again with a pair of tickets for me to give away to a reader. I have two tickets to give away to tomorrow night's game against the New York Knicks. 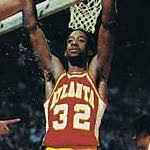 How many times did Dan Roundfield make the first team of the NBA's All-Defensive Team as a member of the Atlanta Hawks? If I receive but one correct answer to the question, that entrant will win the tickets. If I receive more than one correct answer to the question, I will draw a winner, at random, from the pool of correct answers. "As a coach, you want to find a consistency in every single quarter you play. The truth of the matter, that's not going to happen. As I told the guys after the game - and we'll look at the fourth quarter tomorrow in practice - we have to learn from it. To me, that's the most important thing. It happened to cost us a game but the most important thing is that we learn from it. We cannot allow that type of play in the fourth quarter. We cannot allow the snowball effect." It's on this you will be judged and the disappearance or continued allowance of bad shot selection, bad defense, and lack of touches for the team's best player will be duly noted with reference to this very quote. "It was just a total collapse on the defensive end, I thought. We didn’t play with the energy, we didn’t play with the juice, we didn’t play with the intensity that, having been in that situation before, we’ve done in the past." At what point does bad defenders playing bad defense stop being blamed on an absence of energy, intensity, or, god help me, "juice"? "It was not a good display of shot selection, which we talk about over and over, especially on the road. We settled." I've been sympathetic to both Drew and his predecessor for the lack of depth both have been given but it's hard to remain fair on that score when neither uses all the options available to hold players' minutes accountable to their on-court actions on both ends of the floor. If Zaza Pachulia or Marvin Williams or Mo Evans or Jeff Teague came into the fourth quarter of a game because someone took a bad shot or shots or because someone couldn't stay in front of a 34-year-old little person or keep track of the whereabouts of Garrett Temple, or if the team ran one m&*^*$#u@#*&g play for its best player to try and stop a run then this sort of fourth quarter collapse would be less familiar, less easily explicable. "It’s a lesson still being learned, I feel like. I guess when it gets to a point where it hurts you and really bothers you, then you do something about it. I don’t know that we’re there as a team yet." "With everybody back, it seems that the flow is a little different. We just had no chemistry throughout the whole game." Yes, it was Al Horford's 17 points on 9 shots and 5 assists that disrupted the team's chemistry. Or maybe the 5 rebounds* that Marvin Williams grabbed in less than 13 minutes. Let's not let the magnitude of Josh Smith's poor play in the fourth quarter take away from the near-total ineptitude of iso-Joe or his Crawfordesque off-the-ball defense. *That would 4 more rebounds than flow diagnostician Joe Johnson managed to find in 33 minutes of play. "I believe we didn’t play smart the last couple minutes of the fourth quarter, I’d say the whole fourth quarter. We let them make a run and let them do what they wanted." "We just became stagnant on offense." "That's foreign territory to us. We looked like a hell of an offensive team." The Bucks are the second-worst offensive team in the league. They barely average a point per possession. In their two wins against the Hawks, they've averaged over 114 points per 100 possessions. Garrett Temple only arrived in Milwaukee yesterday, but picked up everything he needed to by game time. And the stuff he didn’t know about, he was fed by his teammates throughout the game. Temple said he practiced mainly at point guard in his lone practice with the team, but he saw action exclusively at the two and three on Wednesday night. He looked like a natural fit. He finished with just eight points, but made three of five shots, grabbed three rebounds and handed out three assists while not committing a turnover. He made a particularly key pass to Delfino in the fourth quarter. With the Hawks in a zone and the ball swung to him on the right side, he skipped his pass across the court to a waiting Delfino outside the arc. Delfino finished the play by making the three and the Bucks were up five with 2:29 to go. Plays like that haven’t always been made for the Bucks this season. Guys who have played for the team previously. Guys who played high school basketball in Georgia. Or, guys who are the nephew of someone famous. During Milwaukee's 15-0 fourth quarter run which turned a 78-71 Atlanta lead into an 86-78 Milwaukee lead, a run which lasted four minutes and 40 seconds and six Atlanta offensive possessions, Al Horford literally touched the ball twice. Both touches were fully in service of a tenured guard unable to deal with Milwaukee's ball pressure and were not at all a result of the team making any effort to have their best player touch the ball. On Atlanta's second scoreless possession during Milwaukee's run, Carlos Delfino forced Joe Johnson to pick up his dribble 30 feet from the basket. Horford showed out to the three-point line to relieve the pressure on Johnson. Upon receipt of the ball, Horford immediately returned it to Johnson on the left wing, where Johnson soon missed a contested jump shot. On the fifth of Atlanta's six scoreless possessions during Milwaukee's run, Horford set a ball-screen for Mike Bibby. Bibby was unable to turn the corner and threw a low, two-bounce bounce pass to Horford at the left elbow. By the time the ball got to Horford, he was double-teamed. He passed to Joe Johnson at the top of the key. Johnson dribbled laterally, unable to beat Carlos Delfino, before backing up to launch a three-pointer. It missed wide right. Al Horford scored one-third of Atlanta's 15 fourth quarter points. He took two of Atlanta's 22 fourth quarter shots. Josh Smith attempted more three-point shots in the fourth quarter than Al Horford attempted shots. One might expect that Horford's two game absence might have provided an object lesson in Horford's importance to the team. One might be disappointed. Even the embarrassing abomination of a performance against the Hornets did nothing to make the Hawks wish to make their most efficient and, arguably, most productive offensive player anything more than the team's fourth option. Al Horford scored 17 points on 9 shots (and 3 free throw attempts) and earned 5 assists. He did look rusty early and committed an uncharacteristic four turnovers. Josh Smith scored 14 points on 20 shots (and 3 free throw attempts), earned nary an assist, turned the ball over four times, and was at fault (not entirely, Larry Drew deserves some blame for creating the matchup) for Corey Maggette scoring 10 points in the first 5:23 of the game. Smith attempted as many jump shots as Horford attempted field goals in the game. Smith made one of his nine jump shots. Joe Johnson scored 15 points on 13 shots (and 4 free throw attempts), and earned just two assists. Jamal Crawford scored 20 points on 11 shots (and 9 free throw attempts), and earned three assists. Mike Bibby scored 8 points on 7 shots. Yes, Bibby took just two fewer shots than Horford despite playing 8 fewer minutes. Bibby and Crawford (and Jeff Teague) played a significant role in Earl Boykins scoring 20 points on 11 shots in 26 minutes. Seeing Drew play zone late in the fourth quarter, with the Hawks trailing, just so he could keep all his bad defensive guards on the court to take bad shots simply underlined the caste that exists within this organization. No objective evidence is going to change the allocation of shots or minutes. ATLANTA INJURY REPORT: Al Horford and Marvin Williams are expected to return to action. MILWAUKEE INJURY REPORT: Brandon Jennings and Michael Redd are out. Drew Gooden and John Salmons are game-time decisions. Neither player practiced yesterday. PREVIOUSLY...the Milwaukee Bucks, playing without Brandon Jennings, John Salmons, and Drew Gooden, lost 92-83 to the Bulls in Chicago on Monday. The Hawks and Bucks split their first two meetings this season, with the Hawks winning 95-80 in Milwaukee on December 27th and the Bucks winning 108-91 in Atlanta on November 10th. It was a real treat to be asked to contribute to Voice on the Floor and I'm pretty pleased with the result: five-and-a-half minutes on attendance, demographics, playoffs, and a romantic notion of the meaning inherent in effort, not just success. Fair warning to those of you tempted to listen at work: there is a gratuitous reference to Ed Nealy. Just as in 2009-10, the Atlanta Hawks are much worse in 2010-11 when one-time point guard of the future Jeff Teague is on the court. Teague's box score stats have generally improved in his sophomore season, so it's fair to wonder if the constancy of his on/off stats (with admittedly small sample sizes from both seasons) better represents the quality of his play. Following the lead of the organization's actions, I've essentially written off the possibility of Teague contributing to the Atlanta Hawks now or in the future, but is that fair? Bear in mind that, on the season, the Hawks have outscored opponents by 2.4 points per 100 possessions. Based on both this season's box score stats and the team's performance when Teague plays alongside a genuine, NBA-caliber 2-guard he appears a perfectly adequate backup point guard. Given his youth and the lack of a perfectly adequate starting point guard on the Atlanta Hawks roster he probably still deserves regular minutes both for the benefit of the 2010-11 team and whatever chance exists that Teague has not yet maximized his talents. From 11am (EST) this morning, through 11:59pm (EST) Friday, you can enter to win an all-expense paid trip and tickets to the 2011 NBA All-Star Weekend. Tweet: “I entered for chance to win #AmexSports trip to @NBA All-Star from @americanexpress. I'd bring [insert friend/family member]” to become eligible in the contest. There is a limit of one (1) entry per person/Twitter account per Entry Period. Beginning on January 26th at approximately 11:00 AM Eastern Time through 11:59 PM ET on January 28, fans can enter to win a all-expense paid trip to the 2011 NBA All-Star Weekend by signing up to follow American Express on Twitter. During the entry period, contestants must tweet “I entered for chance to win #AmexSports trip to @NBA All-Star from @americanexpress. I'd bring [insert friend/family member] to become eligible in the contest. There is a limit of one (1) entry per person/Twitter account per Entry Period. During the Entry Period, the randomly selected winners will receive Two (2) round-trip flights and three (3) nights’ accommodations, which are included with the All-Star Entertainment Series Package prizes. Ground transportation and food and beverage are not included. As in life, much of what goes on in sports can be explained by incentives, fears, and a desire for approval. The scope of the book ranges from amusing anecdotes (Over the last 25 years, no major league baseball player stepping to the plate for his final at bat of the season with his batting average sitting at .299 has drawn a walk. ), to succinct presentations of previously published studies (John Huizinga and Sandy Weil's study of the particular value of blocked shots), to the book's centerpiece, a two-chapter, 57-page study attempting to isolate why home field advantage exists across all sports. Though the examination of the authors' overall argument regarding home field advantage has already begun, undertaken by those with the proper statistical talent and experience, this layman found much of the argument compelling even if I can't properly judge the valuations they gave the various effects. Most relevant to the subject of and the audience for this blog, Moskowitz and Wertheim state that, in the NBA, "21 percent of the home court advantage can be attributed to the league's scheduling." Much of the rest they attribute (across all sports, with the amount of home field advantage related to the degree of discretion granted referees in various sports) to referee bias from social influence. In addition to the two long chapters studying home field advantage and the aforementioned chapter on the blocked shot study*, Scorecasting also addresses specifically addresses the NBA with regard to the incentive for officials to err on the side of making incorrect noncalls, the damage done by head coaches overreacting to the possibility a player might foul out, the impact of loss aversion on the final quarter of NBA games, the lack of evidence to support "Defense wins championships," the importance of superstars in winning championships, and the myth of the hot hand. *Unfortunately, they only look at the value of blocked shots per blocked shot which somewhat undermines the argument that Dwight Howard is overrated as a defender due to a high volume of relatively low-value blocks. The accompanying charts of the ten-most and ten-least valuable shot blocking seasons make it possible to see that, with simple multiplication, Howard's 2009, the tenth least valuable season per block is almost exactly as valuable (in total) as Tim Duncan's 2009, the tenth most valuable season per block, because, though each block of Howard's was less valuable than each block of Duncan's, Howard blocked 55 more shots. Some of the most interesting chapters, on the history of the draft pick value chart in the NFL, the preponderance of Dominican minor leaguers who are caught using PEDs, and that attendance at Wrigley correlates better with beer prices than on-field success have nothing to do with professional basketball but should interest the general sports fan. I've given up on Jeff Teague becoming even the backup point guard of the future for the Atlanta Hawks, but Rob Mahoney brings his typically reasonable perspective to bear on the question: What's up with Jeff Teague's minutes? Jeff Teague is no star. He’s a second-year guard who isn’t great at initiating the offense, and isn’t much of a perimeter shooter. He isn’t the type of talent who demands playing time, but merely suggests it politely with each correctly executed possession. He makes mistakes, doesn’t often induce awe, and clearly has a lot to learn. If the Hawks had a legitimately productive starting PG, then Teague’s marginalization would at least be understandable. Yet Bibby is completely useless as a defender, and not terribly effective offensively, either. His adjusted plus/minus puts him at -2.38 for the season, and Bibby’s 12.3 PER is a career low. That PER mark — in addition to Bibby’s higher turnover rate, disappointing points per minute average, etc. — is particularly troubling. PER best measures a player’s offensive contributions and efficiency, and thus should tilt in Bibby’s favor. After all, he’s an offensive player who isn’t forced to do a lot with the ball, and shoots more than half of his attempts from behind the three-point line, an inherently efficient zone. Yet according to his PER, Bibby is inefficient and below average on the end of the court that’s supposed to be his strength. If he’s obviously subpar on offense, what does that make Bibby on defense? A veteran on a team that fetishizes experience? A poor defender playing for a team that appears to evaluate defense on a scale of effort rather than ability or results? I'd be only marginally less surprised were Teague to take minutes from Bibby than for John Schuhmann's next Q&A about the usage of statistics to feature any member of the Atlanta Hawks organization talking about a proprietary statistical database or the 54 defensive criteria they use to grade every defensive possession. The Atlanta Hawks have an above average offense but they're below average at two of the four factors (offensive rebounding, free throw rate) and their turnover rate is almost exactly at the league average. Only when shooting the ball do the Hawks exceed an average team's performance. If you were going to pick just one of the four factors at which to excel, that would be the one but the Hawks are a good, rather than an exceptional field goal shooting team. They rank 11th in the league in eFG%, as many percentage points behind league-leader Boston as they are ahead of 26th and 27th ranked Washington and New Jersey. 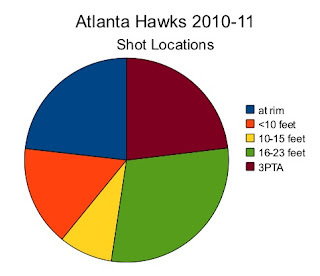 The Hawks aren't an above average shooting team because they take or make a lot of three-point shots. The average NBA team takes 22.4% of their field goal attempts from beyond the arc. The Hawks take 23.1% of their field goal attempts from beyond the arc. The league averages 36% on three-point shots. The Hawks make 36.2% of their three-point shots. The Hawks pick up some ground on the league with their three-point shooting, but not a lot. The Hawks aren't an above average shooting team because they take or convert a high percentage of shots at the rim. The average NBA team takes 27.2% of their field goal attempts at the rim and make 62.9% of those shots. The Hawks take 23.2% of their field goal attempts at the rim and make just 60.6% of those shots. No, the Hawks are an above average shooting team because they make low-percentage shots far more often than an average team. Look at the size of that green piece of pie the Hawks make. Only the Wizards and the Heat use a larger percentage of their field goal attempts on 16-23' jump shots. However, only the Dallas Mavericks better Atlanta's 44.4% shooting from that range. The league, as a whole, shoots just 39.3% from that range. One possible explanation for Atlanta's success: The Hawks earn assists on 69% of their made field goals from that range. The league as a whole earns an assist on just 61.2% of such shots. It's quite possible the Hawks create higher-quality long two-point jump shots than most teams. Looking at the success of individual Atlanta players from that range this season lends some support to this hypothesis. Joe Johnson (36.4% from 16-23') and Mike Bibby (37.6% from 16-23') both create a lot of their own long, two-point jump shots with just 30.4% and 52.3%, respectively, coming off assists. Al Horford (57.7% from 16-23') earns a teammate an assist on 92% of his long two-point jump shots. There's conflicting evidence, as well. Jamal Crawford has made 45.5% of his long two-point jump shots but just 36.9% of them are assisted. Another way the Hawks thrive despite taking so many (generally speaking) low-percentage shots is by taking fewer of the next lowest-percentage shots. 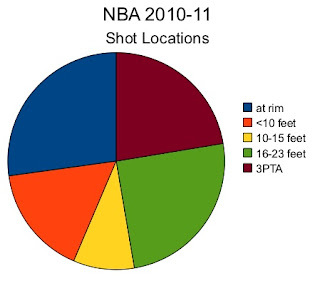 NBA teams typically use 25.5% of their field goal attempts on shots outside of the basket area but inside of 16 feet. The Hawks take just 24.4% of their shots from that vast mid-range. The Hawks best the league average field goal percentage from that range, as well, almost entirely on the strength of Joe Johnson and Al Horford combining to make 129 of 243 shots (53.1%) inside of 10 feet but not at the rim so far this season. The league shoots just 43.4% from that range. Is the unusual nature of Atlanta's shooting success sustainable come the playoffs? The Hawks have played just 15 of their 44 games this season against teams with winning records and they've struggled horribly on the offensive end in those games, averaging less than a point per possession. Given the small sample size and the across-the-board offensive declines the team has suffered against better opposition, it's difficult, if not unreasonable to proffer an answer with any certainty. Whether this is indicative of a larger inability to create high-percentage shots* or the nature of sub-dividing performance into smaller and smaller segments (especially considering said segment includes an historically poor performance) is a fair question. Additional evidence (the Hawks are scheduled to play 10 straight games against teams with winning records in February and March) should help us come to an understanding as to whether the Hawks are forging a distinct path of offensive success or have just discovered a way to leverage their strengths and limit exposure of their weaknesses against less talented and successful teams. *Supporting this notion, Atlanta's below average free throw rate plummets from 22.2 (19th in the league) to 17.0 (would rank dead last, and is less than three-quarters of the league average) when they've played teams with winning records this season. Since we last checked in on Pape Sy at the D-League Showcase, the Flash have gone back to Utah, Sy's entered the starting lineup, and he's played much better. In the four games he's started, Sy has averaged 13 points a game and made 18 of 25 two-point field goal attempts. Both his assists and turnovers are down (1 and 1.25 per game, respectively) as he's presumably spending less time handling the ball. Unofficial on/off numbers, assuming Utah haven't played much faster or slower with Sy on the court and that he's played an equal number of offensive and defensive possessions: Utah are +2.7 points per 100 possessions with Sy on the floor, +0.5 points per 100 possessions with Sy off the floor over his ten games with the team. It's difficult to flush the memory of Friday night's performance from the brain (or any other organ, really) but the Hawks, after 25 more minutes of poor basketball, took advantage of the only opportunity the schedule presented them to save face and dismantled a poor Charlotte team on the road for a solid 20 minute stretch of the second half. Joe Johnson led the way for the Hawks with an explosive, discretionary offensive performance. Among Bobcats, only Gerald Wallace could guard Johnson and the Hawk rarely forced the issue when matched up against Wallace in isolation. Johnson hoarded his possessions to use them on the many, many times Charlotte presented him with an advantageous matchup. It takes talent and self-discipline to score 32 points on 18 shots (plus 6 free throw attempts) and Johnson displayed both attributes throughout the night. We're at the point when Josh Smith using 5 of 14 field goal attempts on jump shots counts as a measure of self-discipline, though it's a bit disappointing that Smith has not increased his contributions on the glass in Horford's absence, his 16 points on those 14 shots provided Johnson ample support in the scoring column, though. Without Smith stepping up on the defensive glass, Zaza Pachulia (making a long-overdue start at center) pitched in with seven defensive boards in just under 28 minutes and Mike Bibby grabbed eight crucial defensive rebounds of his own while playing nearly 37 minutes. Though he made a couple of handy shots in the second half, defensive rebounding was the greatest of Bibby's positive contributions. It was clear watching him struggle on both ends of the floor in the first half (2-6 shooting, two assists, routinely torched by both DJ Augustin and Shaun Livingston) yet play more than 18 minutes that the question must change from "Is Jeff Teague the point guard of the future?" to "When will the Hawks get rid of Jeff Teague and use his roster spot on a point guard the head coach believes can contribute?" Because Mike Bibby, though he does his level best and the talents of his teammates can paper over some his obvious weaknesses, is no longer a good NBA player and cannot reasonably be expected to play 30 minutes a night. "I thought our guys came out tonight, especially after last night's embarrassing loss, and played with a lot of pride." "We had a chance to clean up our mess, and that's what happened."